In order to do so, you’ll have to get some of these opinions coming back to you in the first place. Fortunately, there are many different avenues that may be used to collect and/or receive feedback. Many companies will send their clients follow-up surveys and questionnaires, usually emailing a link to the client once their service is completed. This is a very low-cost method that a business may consider, but also run a risk of very low response rates without any incentive for the contact to complete them. This risk can be resolved by offering some perk in return for a response, just be careful not to offer something of too high of a value. Another option for collecting a record of a client’s experience is to distribute brief surveys or links to surveys online as soon as a service is completed. This allows you to collect impressions of your clients experience with your service, while they’re still fresh and most accurate to the client’s honest feelings. Another option is to distribute feedback cards at a service’s completion, once again pushing for an accurate, up-to-the-moment impression of the client’s thoughts. Finally, you can always keep your ear to the wall for any information that is being spread through word-of-mouth, whether good or bad, to augment your collection of client opinion. A great time to get feedback from your current clients is during a Quarterly Business Review (QBR). For those clients who don’t normally participate in surveys or are hesitant to contact your company with their issues, QBRs give candid opportunities to get feedback and boost customer satisfaction. As John Lydgate said (and Abraham Lincoln later adapted), “You can please some of the people all of the time, you can please all of the people some of the time, but you can’t please all of the people all of the time.” In other words, you can’t expect all of your collected evaluations to be glowing reviews -- which is a good thing, believe it or not. Feedback, after all, is meant to help you improve upon what you currently have been doing. As a result, most of it should be critical and point out your flaws to at least some degree. That being said, while feedback should always be seriously considered, it also should all be taken with a grain of salt. There are many people, after all, who will complain simply for the sake of complaining, not to mention those who seem to be chronically unhappy with anything and everything they encounter. In short, it is best to keep in mind that not all of your collected feedback will be fair. Even if it was, you simply can’t please everyone, so you should focus on pleasing those who you can. 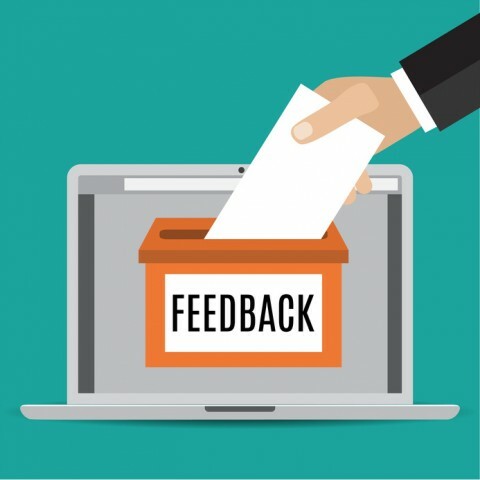 Returning to the valid negative feedback you will almost certainly receive, it is important that these complaints and critiques aren’t just disregarded in favor of the more positive comments your clients leave for you. If someone reports that they experienced an issue, investigate a little by checking for that issue yourself or seeing if another client has also made mention of it--both to confirm that the issue exists due to factors other than user error and to establish a pattern that may explain where root of the issue might lie.. Once the issue has been confirmed, do your best to resolve it. Ideally, you will be able to respond directly back to the complainants to share the news of your improvement. If the feedback you’ve collected happens to be positive, use it as leverage. Post about it, refer to it in your marketing, and try to reach out to the reviewer to obtain a written testimonial. If your feedback is given in the form of a social media comment, respond to it. This gives you the opportunity to graciously accept complimentary reviews, and the ability to act upon any complaints that you are sure to hear (this is the Internet, after all). In short, customer and client feedback is incredibly important, as it can provide insight into where your company’s path is leading. This feedback is also unadulterated by your own biases, or by the biases that come from being “too close” to the issue. In short, accepting and internalizing feedback acts as a litmus test for your initiatives, telling you which are good, which aren’t, and what can be fixed. An outsider’s perspective can grant your business with some truly great benefits. All feedback is just that perspective coming in. Contact us if you'd like help collecting or acting upon feedback.